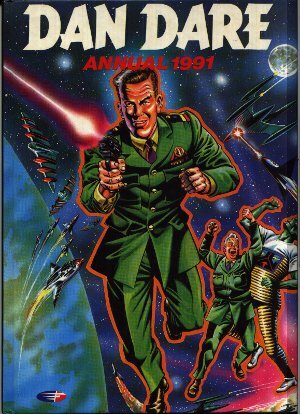 Dan Dare Annual 1991 sees an increase in price and a decrease in the page count. However, all the classic elements are there with a mixture of picture-strip and text stories, with the majority in full colour. Dan Dare's latest monster enemies come to a watery end. Dimensions : 19cm x 27cm with 63 pages. Meet the monster that Waterises people! Brief biographies of the good and the bad. Digby gets his own story. Find out which two Pythons are Dan Dare fans.